April 5, 2019 – NASA is a step closer to returning astronauts to the Moon in the next five years following a successful engine test on Thursday at NASA’s Stennis Space Center near Bay St. Louis, Mississippi. The latest “hot fire” was the culmination of four-plus years of testing for the RS-25 engines that will send the first four Space Launch System (SLS) rockets into space. Acceptance testing of all 16 former space shuttle main engines that will help launch the first four SLS missions. NASA has contracted with Aerojet Rocketdyne to build new RS-25 engines for additional SLS missions, and work already is underway to do so in the company’s factory in Canoga Park, California. Developmental and flightworthy testing for new controllers (plus one spare) to be used by the heritage RS-25 engines for the first four missions. A 51-month test series that demonstrated RS-25 engines can perform at the higher power level needed to launch the super heavy-lift SLS rocket. The RS-25 rocket engine test era began January 9, 2015, with a 500-second – more than 8 minutes – hot fire of RS-25 developmental engine No. 0525 on the A-1 Test Stand at Stennis. NASA tested the first SLS flight engine on March 10, 2016. 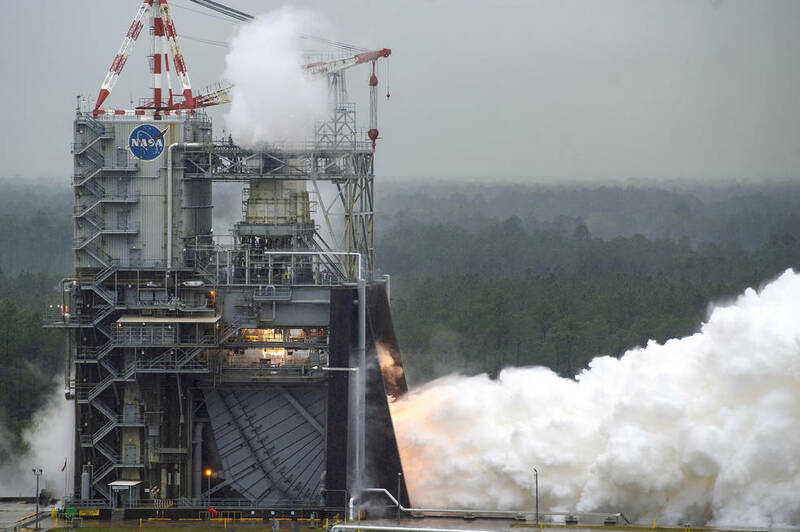 Altogether, the agency has conducted 32 developmental and flight engine tests for a total of 14,754 seconds – more than four hours – of cumulative hot fire – all on the A-1 stand at Stennis. Having launched 135 space shuttle missions, these main engines are considered the most tested engines in the world. When the Space Shuttle Program ended in 2011, NASA still had 16 engines that ultimately were modified for SLS. These engines were originally designed to perform at a certain power level, known as 100 percent. Over time, the engines were upgraded to operate at higher and higher power levels, up to 104.5 percent operating power level by the end of the shuttle program. For SLS, that operating level has to be pushed even higher. To help accomplish that, and to interface with new rocket avionics systems, NASA designed and tested a new engine controller, which serves as the “brain” of the engine to help monitor engine operation and facilitate communication between the engine and rocket. Early developmental testing at Stennis provided critical information for designing the new controller. The first new flight engine controller was tested at Stennis in March 2017, with a string of controller hot fires to follow. The April 4 test marked the testing of the 17th engine controller for use on SLS flights, providing enough for all 16 heritage RS-25 engines. With development of the new controllers, NASA had to test the new power level as well. First, it was demonstrated that the engine could perform at the needed 111 percent power level. Next, NASA needed to prove a margin of operating safety. In February 2018, operators pushed the engine to 113 percent power for a total of 50 seconds. It lengthened that firing time in two subsequent tests, until late this February, when the engine was fired at 113 percent power for 430 seconds of a 510-second test. That set the stage for Thursday’s successful test of flight engine No. 2062. When this specific engine fires again, it will help send astronauts aboard Orion around the Moon on a test flight known as Exploration Mission-2. The president’s direction from Space Policy Directive-1 galvanizes NASA to return to the Moon and builds on progress on the Space Launch System rocket and Orion spacecraft, efforts with commercial and international partners, and knowledge gained from the current robotic presence at the Moon and Mars.